We have been invited to perform at their Anzac Day Service again this year. Service starts at 11am.SA uniform to be worn. You only need to bring your Anzac Book. Venue is on Cnr. of Hastings River Drive and Boundary St.(opposite the traffic lights). Singing for the residents. Please wear full uniform. New members are most welcome. please wear black pants/skirt and a white shirt and black shoes. Sing Australia Group Toowoomba will be singing at Northridge Salem main hall on Wednesday 24th April from 10am to 11am. Address 44 Holberton Street, Toowoomba. We will be singing at Greenslopes Mall in recognition of Anzac Day. Assemble at right of memorial for a sound check at 10.30 . Sing as March is on and people are gathering. Lead the singing as set in the program from ANZAC books. Transfer to Club Jervis Bay for refreshments. 4.10am for a 4.20 start at Memorial Park Kingaroy. 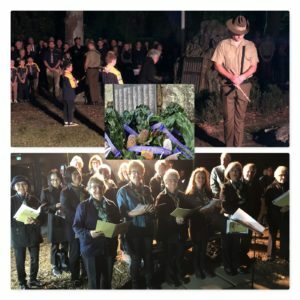 The Gordon group will be leading the singing at the Anzac Day Dawn Service, held in the memorial park adjacent to the Roseville RSL Memorial Club, Pacific Highway, Roseville. Full uniform is required. Breakfast will be served after the service in the club. Singing various songs from the Anzac Book for the Dawn Service - Anzac Day. Wear full uniform .